If you want to know what the “top people on FriendFeed” are saying, you can now see their feeds on a new Alltop page called Frienderati. It is just a list of the top 100 or so names on FriendFeed (actually, only 94, for some reason), listed in alphabetical order by first name along with their five latest Twitters, blog posts, and other FriendFeed items. Or you could just subscribe to those same people on FriendFeed. All the usual suspects are included on Frienderati. Mostly bloggers and other Web celebrities like Dave Winer, Loic Le Meur, Kevin Rose, and Guy Kawasaki (who is also one of the founders of Alltop and last week sold his other project, Truemors, to NowPublic). The site does not explain how someone gets on the list, but it appears to be the most followed individuals on FriendFeed. (Compare to this list on User21). 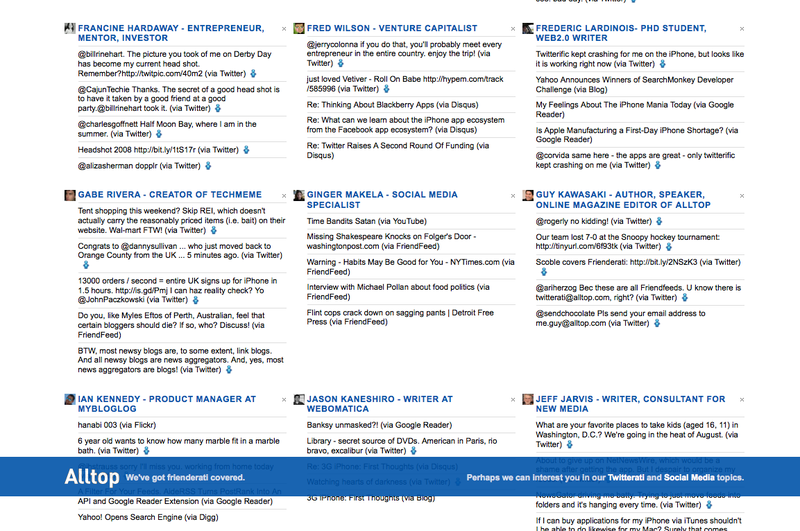 There is a lot of overlap here with another Alltop site, Twitterati, which (you guessed it) shows the latest Tweets of the “top” people on Twitter (Kawasaki, Winer, Robert Scoble, etc.). Since most of the content on FriendFeed comes from Twitter anyway, Frienderati is really is pretty much the same thing, with a few different names. Like other Alltop sites (which aggregate top feeds in other categories), this one is kind of a head-scratcher. There is no way to sort, so I guess you are expected to scroll through all 94 names to get what you are looking for. It would be helpful if the names at least appeared in order of their most recent entries, like on FriendFeed itself. Or you could just browse Friendarati to see which, if any, of the top names you might want to follow on your own. (Even though the point of FriendFeed is to follow what your real friends are saying—oh, never mind). I like the name, though. It sounds like a cabal, and maybe it is. But I guess Top Friends was already taken. Update: In an email, Kawasaki says the list is “based on all the other articles about the top people to follow plus our gut. Did we say it’s 100? We just tried to find about 100.” And he notes in a comment below that it is just meant to be a starting point for FriendFeed. Thomas Hawk – CEO Zooomr Inc.